This is true in Munchkin as well- weapon modifiers will be placed under the relevant weapon to see only the bonus. 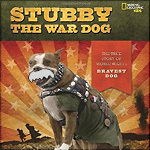 This is shaping up, Stubby, I'm looking forward to it. Maybe you can adapt this method to buildings, too. It may not always work well because many cards have connection points on more than one side. But at least for weapons and the cards like the control bubble that are dead ends this should work fine. You can use the covered area for the image. Just don't leave it blank. knolli wrote: If you have other cards that give additional bonus (or a hero who uses better dice or several wapons at once), an additional d6 can become a d10+6 quite fast (probably). I don't know the combat mechanics yet, but as far as I can see, the spear doesn't add any bonus damage at all. 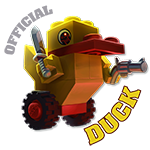 There will be cards that give bonuses to weapons, but they also increase the size of the weapons so they won't be useable by minifigs anymore. In the hands of a hero who can use several weapons at once, a card with two 1d6 attacks is the same as giving him two cards with one 1d6 attack, so if there's a balance problem there it's with the hero and not with the weapon card. 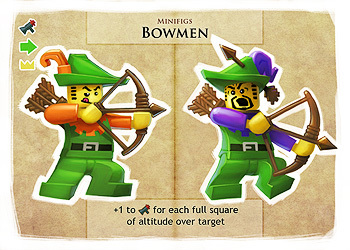 The spear has no bonus damage, but allows minifigs to strike targets higher or lower than they'd normally be able. knolli wrote: Maybe you can adapt this method to buildings, too. With buildings the actual shape of the building on the table matters for attacks, so I don't want to put cards any further behind other cards than what's already designed in. Do you plan to introduce cards with momentary effect? Something that adds boni until end of turn or damages an opponent once? Because every damage or to-hit bonus appilied to the minifig would be doubled by the knife. The same goes for every bonus you get by higher ground or similar circumstances. And considering that you only have a limited number of about three to five minifigs under your control, having an additional attack may change the entire game. 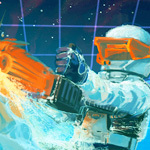 knolli wrote: Do you plan to introduce cards with momentary effect? Something that adds boni until end of turn or damages an opponent once? Because every damage or to-hit bonus appilied to the minifig would be doubled by the knife. The same goes for every bonus you get by higher ground or similar circumstances. Nope. No event cards, no effect cards. The fanciest bonuses come from heroes who are naturally self-limiting. If you're stuck with three to five minifigs, then I've designed the game badly, because Zahru needs somebody to field a minimum of five victims in one place in order to score. 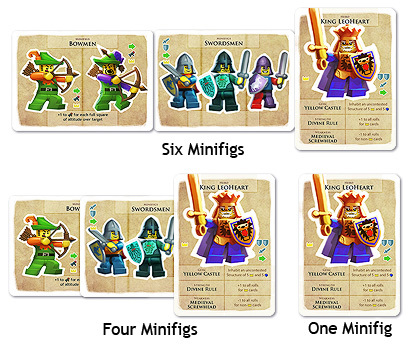 Hence the multiple-minifig cards to boost numbers quickly; there are more of those on the way. If Zahru has to kill 5 minifigs to win, you want people to play with 18 to 36 cards, and there's only 5 or 10 minifigs respectively in those decks, isn't that going to be a bit hard? Hey! Look at the cards I've already posted. There's five minifigs right there in only two cards. I think it'll be fine. Worst comes to worst, the Zahru player can focus efforts on collecting the minifigs himself and killing his own doods. The bottleneck is going to be collecting enough weapons and getting the lucky rolls, not collecting the minifigs. I forget if I talked about this earlier, but this is why multi-minifig cards always have to be squadded to another card, so they can be hidden behind it as they die off. Oh, alright. I was confused by the multiple minifigs on one card, but I remember the whole squadding up thing now. Interessting. So the card only goes to the corpse pile when the last mini of the group is killed? That adds some new depths. 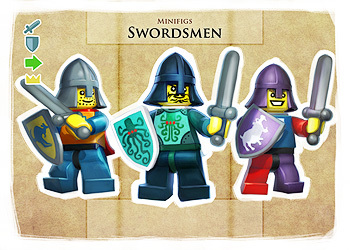 Can you heal/resurrect fallen minifigs of a group or otherwise replace them or do you have to kill the group, get the card from the corpse pile and play it again? Any ability that allows you to resurrect a corpse from the pile should also let you revive a fallen minifig from a group, I would think. It won't come up very often in this first set since the medieval deck doesn't include mediks or any other healer units. I'm thinking about putting Rody's Bar in here instead though, whose special ability is that it lets you find troops you had thought were dead but were actually just faking. ...that's perfect. Does that mean that you'll include the Hill as well? The Hill could be a box set with like 4 decks included within it and a special "The Hill" card. How are things comming along? Are you making progress? Wow, good thing you did. This is awesome and I am 100% ready to print off two decks and playtest this with my roommate.